Serratia marcescens is a gram-negative bacterium and often causes nosocomial infections. There have been few studies of the virulence factors of this bacterium. The only S. marcescens hemolytic and cytotoxic factor reported, thus far, is the hemolysin ShlA. An S. marcescens shlAB deletion mutant was constructed and shown to have no contact hemolytic activity. However, the deletion mutant retained hemolytic activity on human blood agar plates, indicating the presence of another S. marcescens hemolytic factor. Functional cloning of S. marcescens identified a phospholipase A (PhlA) with hemolytic activity on human blood agar plates. A phlAB deletion mutant lost hemolytic activity on human blood agar plates. 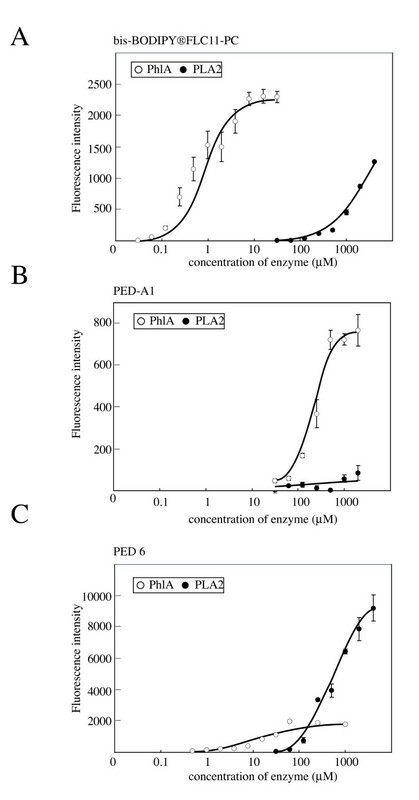 Purified recombinant PhlA hydrolyzed several types of phospholipids and exhibited phospholipase A1 (PLA1), but not phospholipase A2 (PLA2), activity. The cytotoxic and hemolytic activities of PhlA both required phospholipids as substrates. We have shown that the S. marcescens phlA gene produces hemolysis on human blood agar plates. PhlA induces destabilization of target cell membranes in the presence of phospholipids. Our results indicated that the lysophospholipids produced by PhlA affected cell membranes resulting in hemolysis and cell death. Serratia marcescens is widely distributed in natural environments and has emerged in the last two decades as an important nosocomial pathogen, mainly in immunocompromised patients [1, 2]. Although S. marcescens pathogenicity is poorly understood, its extracellular secreted enzymes, including several types of proteases, are candidates for virulence factors . Other factors (e.g., fimbria for adhesion, lipopolysaccharide (LPS), and ShlA hemolysin) have also been suggested as virulence factors [2, 3]. Hemolysins are produced by various pathogenic bacteria and have been proposed to be responsible for their pathogenesis [4–6]. These hemolysins, including S. marcescens ShlA, also have cytolytic activity . One type of hemolysin/cytolysin is a group of pore-forming toxins. This type of toxin typically forms a homo-oligomer integrated into its target cell membrane, thereby changing the cell permeability and leading to cell death. ShlA has been shown to increase cell membrane permeability, but not to form an oligomer . Another type of hemolysin has phospholipase C (PLC) activity. The α-toxin produced by Clostridium perfringens is the most thoroughly investigated PLC, but the molecular mechanism for its disruption of red blood cells (RBC) is not fully understood . The pathogenic effects of other types of phospholipases, such as phospholipase A (PLA), have been studied in various bacteria, including Helicobacter pylori (PldA) , Legionella pneumophila (PlaA) , Campylobacter coli (PldA) , and Yersinia enterocolitica (YplA) . Two extracellular PLAs, PhlA and PlaA, have been described previously in Serratia species [13, 14]. PlaA is produced in Serratia sp. strain MK1 isolated from Korean soil . The amino acid sequence of PlaA was found to have significant similarity (80%) to PhlA from S. marcescens MG1, which was originally classified as S. liquefaciens [13–15]. However, the cytotoxic and hemolytic activities of these enzymes have remained unclear, and the importance of PLA in bacterial virulence is not well understood. S. marcescens produces two types of hemolysins: contact-dependent hemolysin and extracellular hemolysin . The ShlA hemolysin has cytolytic and contact-dependent hemolytic activity, but little is known about the S. marcescens secreted hemolysin. The gene cassette responsible for the production and secretion of ShlA is shlAB, with shlA encoding the structural gene for hemolytic activity and shlB required for activation and secretion of ShlA in the presence of the cofactor phosphatidylethanolamine . ShlA production is higher at 30°C than at 37°C . In this study, we cloned an S. marcescens gene that produced hemolytic activity on human blood agar plates. The gene, designated phlA, encoded an extracellular PLA activity. We also showed that PhlA hydrolyzed phospholipid to lysophospholipid, which directly lysed human, horse, and sheep RBC and cultured cells. Taurocholic acid sodium salt hydrate and ethylenediamine-N,N'-diacetic acid (EDDA), L-α-phosphatidylcholine (PC) and L-α-phosphatidylethanolamine (PE) were purchased from Sigma. Cardiolipin (CL), L-3-phosphatidylinositol (PI) and sphingomyelin (SPM) and L-α-lysophosphatidylcholine (LPC) were purchased from Doosan Serdary Research Laboratories. Lecithin from egg yolk was purchased from Wako Chemicals. Phospholipase A2 derived from bovine pancreas was purchased from Sigma. S. marcescens niid 298 strain is one of our reference strains for serotyping, which is originally isolated from urine. E. coli K-12 DH5α and pBR322 were used for shotgun cloning. The pGEM-Easy vector (Promega) was used for cloning. pCold1 and pG-KJE8 (TaKaRa) were used as expression vectors in E. coli BL21 [F-, ompT, hsdSB (rB- mB-), gal, dcm] (TaKaRa). Unless otherwise specified, bacteria were grown in Luria broth (LB). Antibiotics were added as required for the following final concentrations: ampicillin, 200 μg/ml; kanamycin, 100 μg/ml; and chloramphenicol, 20 μg/ml. Peripheral human blood was obtained from healthy volunteers with their informed consent according to the guidelines laid down by the Ethics Committee of National Institute of Infectious Diseases. Horse and sheep blood were obtained from Kohjinbio. RBC were washed three times with phosphate-buffered saline (PBS) by centrifugation at 850 × g for 10 min. Washed RBC were resuspended in PBS to a final concentration of 2.5% (vol/vol) and used for hemolytic activity assays. Blood agar plates contained 12.5 g Bacto-tryptone, 5 g NaCl, 5% (v/v) RBC, 10 mM CaCl2, and 15 g agar (per liter), and the pH was adjusted to 7.2 . PCY medium plates, which contained 10 g Bacto-tryptone, 5 g yeast extract, 5 g NaCl, 20 mM CaCl2, 5 g taurocholic acid, 15 g egg yolk lecithin, and 15 g agar (per liter), were used for determining phospholipase activity . Shotgun cloning was used to identify hemolytic factors as follows. S. marcescens strain niid 298 genomic DNA was digested with Sau3AI, ligated into a pBR322 vector BamHI site, and introduced into E. coli DH5α. Colonies that induced hemolysis on human blood agar were selected as candidate hemolysin clones. The inserted fragments were amplified by PCR and complete fragment sequences were determined using a 3130 Genetic Analyzer (Applied Biosystems). The S. marcescens nucleotide sequences determined in this work have been deposited in the DDBJ/EMBL/GenBank databases under the following accession numbers: AB505202 and AB505203 for the phlA and phlB genes of S. marcescens niid 298. A one-step inactivation method [19–21] was used to obtain shlBA and phlAB deletion mutants. For construction of a shlBA deletion mutant, PCR products were amplified from pKD4  with primers ShlBA5' (5'-GGTTAACCTCATGGATTGGGCTGGCTGCCCCGGCGGCCTCTCATAGTGTAGGCTGGAGCTGCTTC-3') and ShlBA3' (5'-GCAAAACTCCACGCCTGCCGTCATGCTTCATGTCACTGTCAGCAACATATGAATATCCTCCTTAGT-3'), which flank the 5' and 3' termini of the shlBA gene with 45 bp homology, and electroporated into S. marcescens niid 298 carrying pKD46 . For construction of a phlAB deletion mutant, primers PhlAB5' (5'-AGCGCCAGTAAGGCTATCGCCAGCGCCCGCCGCAAGCGACCCCCTCATATGAATATCCTCCTTAGT-3') and PhlAB3' (5'-TGCCTAAGAAAAAACCGCCTGTACAGGCGGTTTTTTTATGGGCGTCATATGAATATCCTCCTTAGT-3') were used. The correct mutation was verified by PCR using three different primer sets as described previously . The full-length phlA gene was obtained from S. marcescens niid 298 genomic DNA by PCR with primers phlA5' (5'-GAATTCCATATGAGTATGCCTTTAAGTTTTACCTCTG-3') and phlA3' (5'-GCTATCTAGATCAGGCATTGGCCTTCGCCTC-3'). The 5'- and 3'-termini of the PCR product were NdeI and XbaI restriction enzyme sites, respectively. The PCR fragment cleaved by these restriction enzymes was inserted into NdeI/XbaI-digested pCold1, which has a histidine tag site at the 5'-terminus, and used to transform E. coli DH5α. The resulting plasmid, pCold1-phlA, was introduced into E. coli BL21 harboring pG-KJE8 . The transformant was used for expression of His-PhlA according to the manufacturer's instructions. To purify the His-PhlA recombinant protein, cells were harvested, lysed by lysis buffer [50 mM NaH2PO4, 300 mM NaCl, 10 mM imidazole, and protease inhibitors (one tablet of inhibitor mixture (Complete, Roche)/25 ml)], incubated in a final concentration of 1 mg lysozyme/ml for 20 min on ice, and then disrupted by sonication. Cell debris was removed by centrifugation. The supernatant was analyzed by affinity chromatography using Ni-NTA agarose (Qiagen) under native conditions without a protease inhibitor. After dialysis against PBS, the purified protein was concentrated by Amicon Ultra-15 (MWCO = 30 K; Millipore). The protein concentration was determined using a BCA Protein Assay Kit (Pierce). We obtained approximately 1.9 mg purified recombinant protein (His-PhlA) from one liter of culture. The purified protein was analyzed by sodium dodecyl sulfate-polyacrylamide gel electrophoresis (SDS-PAGE) with Coomassie blue staining. The assay for contact-dependent hemolysis was performed as described previously . Briefly, S. marcescens cells were cultured in LB containing EDDA (2 mM) at 30°C or 37°C and harvested at log phase. Bacteria (1.2 × 108 cells in 50 μl PBS) were mixed with 70 μl RBC and centrifuged (500 × g for 1 min). The mixture was incubated for 60 min at 30°C or 37°C with shaking. Hemoglobin released from lysed RBC was measured spectrophotometrically at 405 nm. Osmotic lysis of RBC in distilled water was taken as 100% hemolysis. The hemolytic activity of purified PhlA in solution was measured as described previously [24, 25], with the following modification. The RBC suspension containing 0.15 mg lecithin/ml, 0.06% taurocholic acid and 2 mM CaCl2 was incubated with His-PhlA at 37°C for 1 h. After centrifugation (500 × g for 10 min) the supernatant was assayed spectrophotometrically. RBC were not lysed by this low concentration of taurocholic acid. Fluorogenic, BODIPY FL-labeled, phospholipase A substrates bis-BODIPY FL C11-PC, PED6, and PED-A1 (Invitrogen) were used to determine the specificities of PLA1 and PLA2. The bis-BODIPY FL C11-PC is glycerophosphocholine with BODIPY FL dye-labeled sn-1 and sn-2 acyl chains. PED-A1 and PED6 are glycerophosphoethanolamine with dye-labeled sn-1 and sn-2 acyl chains, respectively. The bis-BODIPY FL C11-PC was self-quenched, and PED-A1 and PED6 fluorescence was quenched by added dinitrophenol. Release of the fluorophores by acyl chain cleavage by either PLA1 or PLA2 results in increased fluorescence. Each substrate solution (45 nM) was prepared in 10 mM Tris-HCl (pH 8.0), 100 mM NaCl, and 10 mM CaCl2 . A 90 μl sample of each substrate solution was incubated with various concentrations of enzymes (10 μl) in 96-well plates for 6 min, and fluorescence intensity was measured. The fluorescence background for each quenched substrate solution was determined without PhlA treatment. Fluorescence intensity was measured at 485 nm excitation and 530 nm emission using an Appliskan fluorescence microplate reader (Thermo Electron Corporation). Non-esterified fatty acids (NEFA) released from phospholipids (PLs) were quantitated by an enzymatic colorimetric method using a NEFA-C kit (Wako chemical, Japan) . Substrate solutions were prepared by dissolving 5 mg of various phospholipids in 1 ml of a solution of 2% taurocholic acid and 10 mM CaCl2. A 29 μl sample of each substrate solution was mixed with 1 μl His-PhlA and incubated at 37°C for 1 h. Background NEFA absorbance was estimated using non-His-PhlA treated substrates. NEFA concentrations were calculated from a calibration curve determined using oleic acid as a standard. PC (0.65 mM) was incubated with 8.3 μM His-PhlA at 37°C for 1 h in the presence of 2% taurocholic acid and 10 mM CaCl2. The reaction was terminated by placing the samples on ice. The samples were dried with a SpeedVac concentrator, dissolved in 20 μl chloroform/methanol (2/1, vol/vol), applied to thin-layer chromatography plates (PE SILG; Whatman), and separated with chloroform/methanol/water (65/25/4, vol/vol/vol). LPC (1.0 mM) was analyzed on the same plate as a reference. Phospholipids on the plate were visualized with Dittmer-Lester reagent . HeLa and 5637 cells (derived from a human cervical cancer and bladder carcinoma, respectively) were grown in Dulbecco's Modified Eagle's Medium (DMEM) and 1640 RPMI medium, respectively, plus fetal calf serum (10% v/v) at 37°C in the presence of 5% CO2. At 24 h before the start of cytolysis experiments, 96-well culture plates were seeded with 1.0 × 104 cells per well. After washing with medium, the cells were incubated with various concentrations of His-PhlA in 100 μl lecithin solution (313 μg/ml lecithin, 0.125% taurocholic acid, and 2 mM CaCl2 in DMEM) at 37°C for 1 h. Cytolysis was measured as the amount of lactate dehydrogenase (LDH) released as determined with a CytoTox 96 Non-Radioactive Cytotoxicity Assay Kit (Promega) . Complete (100%) cytolysis was determined by measuring LDH release after cell lysis with 1% Triton X-100. S. marcescens niid 298 showed hemolytic activity visible as clear zones on human, sheep, and horse blood agar plates (Fig. 1A). The zones were larger for bacteria grown at 30°C than at 37°C. S. marcescens also showed contact-dependent hemolytic activity on human RBC, which was also greater for bacteria grown at 30°C than at 37°C (Fig. 1B). Hemolytic activity of S. marcescens. (A) Hemolytic activity of S. marcescens strain niid 298 on several blood agars. Cells (1 × 106) were cultured overnight, and then inoculated on various blood agars and incubated at 30°C or 37°C for 16 h. Clear zones indicated hemolysis. (B) Contact hemolysis assay for human RBC. Cells harvested in log phase were mixed with washed human RBC and incubated at 30°C or 37°C for 1 h with shaking. Released hemoglobin was measured spectrophotometrically as absorbance at 405 nm. Results are shown as percent lysis compared to complete lysis of RBC in distilled water. (C) Hemolytic activity of the shlBA deletion mutant on human blood agar. Experiments were performed as in (A). Since ShlA is the only hemolysin that has been reported in S. marcescens , we constructed an shlBA deletion mutant. 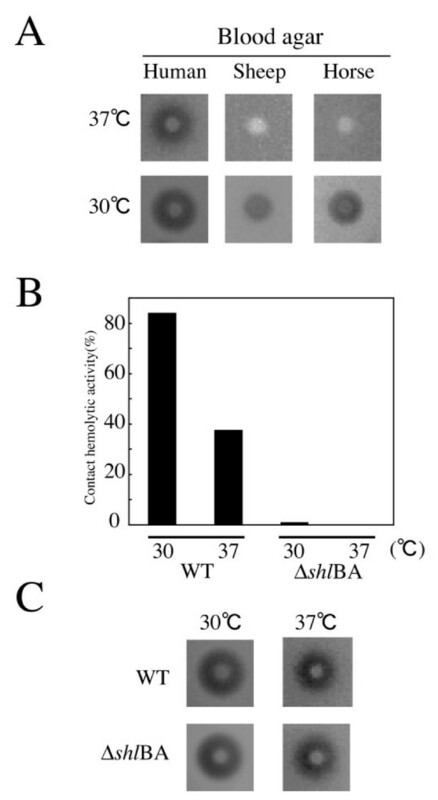 The mutant grown at both 30°C and 37°C lost its contact-dependent hemolytic activity (Fig. 1B), but retained hemolytic activity on human blood agar plates (Fig. 1C). These results indicated that S. marcescens had a hemolysin other than ShlA. To clone the S. marcescens hemolysin identified on human blood agar, we constructed a library of S. marcescens strain niid 298 DNA in E. coli DH5α. Approximately 13,000 transformants were examined for hemolytic activity on human blood agar plates and four hemolysin-positive clones were obtained. One clone showed hemolytic activity on human, sheep, and horse blood agar plates, but the other three clones showed activity only on human blood agar. Sequence analysis of the inserts in the three clones with hemolytic activity only on human blood agar showed that all three had phlA and phlB genes with nucleotide similarity to phlA and phlB (94% and 94%, respectively) of S. marcescens MG1, which was originally classified as S. liquefaciens [13, 15]. The phlA and phlB deduced amino acid sequences were similar to Serratia sp. MK1 PlaA and PlaB (81% and 73% identity) and Y. enterocolitica YplA and YplB (60% and 50% identity) [12, 14]. PhlB has been suggested to be an inhibitor of PhlA inside the cell in which they are produced, thereby functioning to prevent PhlA activity until its release into the extracellular milieu . Although there are no data about a PhlA hemolytic activity, since some other phospholipases have hemolytic activity, we investigated whether the S. marcescens phlA gene product might be a hemolysin. To confirm that phlAB had phospholipase and hemolytic activities, we constructed the phlAB expression vector pGEMeasy-phlAB and introduced it into E. coli DH5α. E. coli DH5α/pGEMeasy-phlAB showed a clear zone on PCY agar plates containing egg yolk lecithin as a substrate for phospholipase, in contrast to E. coli DH5α carrying an empty vector, indicating that PhlAB produced in E. coli DH5α/pGEMeasy-phlAB degraded phospholipids (Fig. 2A). In addition to phospholipase activity, E. coli DH5α/pGEMeasy-phlAB showed hemolytic activity on human blood agar plates (Fig. 2A). Phospholipase and hemolytic activities of S. marcescens PhlA. (A) Overnight cultures of wild-type strain S. marcescens niid 298, E. coli DH5αcells carrying pGEMeasy, E. coli DH5αcarrying pGEMeasy-phlAB, S. marcescens niid 298 phlAB deletion mutant, and S. marcescens niid 298 phlAB deletion mutant carrying pGEMeasy-phlAB (1 × 106 cells) were inoculated on blood agar plates and PCY agar plates and incubated at 37°C for 16 and 24 h, respectively. (B) Purified His-PhlA (1 μg) was separated by 12.5% SDS-PAGE, and then was stained with Coomassie blue. Protein standards were in lane M, with relative molecular masses (kDa) at the left. (C) Various phospholipids were mixed with His-PhlA and incubated at 37°C for 1 h. Free fatty acids (FFA) released from phospholipids were detected using a NEFA-C kit. The amount of FFA was determined from an oleic acid calibration curve. Values are averages ± SE of three independent experiments. We next constructed an S. marcescens niid 298 phlAB deletion mutant. 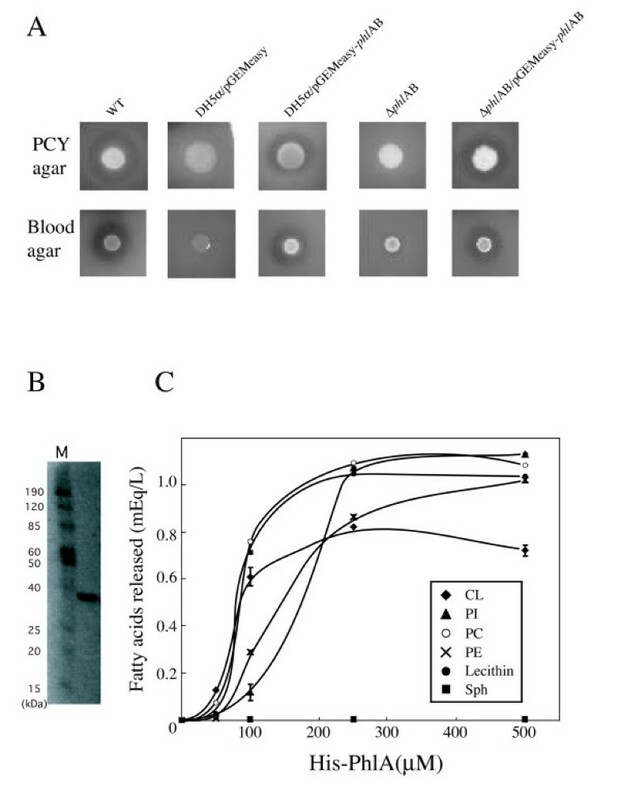 The S. marcescens ΔphlAB mutant did not exhibit hemolytic activity on human blood agar plates or phospholipase activity on PCY agar plates (Fig. 2A). In contrast, the ΔphlAB mutant retained contact-dependent hemolytic activity against human RBC (data not shown). An S. marcescens ΔphlAB mutant carrying phlAB regained hemolytic and phospholipase activities (Fig. 2A), confirming that PhlAB had both activities. To investigate PhlA hemolytic and phospholipase activities, we purified a recombinant His-PhlA protein produced in E. coli (Fig. 2B). Purified His-PhlA had hemolytic activity human blood agar plates, but not on horse or sheep blood agar plates, and phospholipase activity on PCY agar plates (data not shown). These data indicated that PhlA had hemolytic and phospholipase activities, indicating that PhlB was not required for the PhlA activities. We next studied the specificity of PhlA phospholipase. Phospholipase A (PLA) hydrolyzes the fatty acids of PLs at position sn-1 for phospholipase A1 (PLA1) and sn-2 for phospholipase A2 (PLA2), resulting in the release of free fatty acids and production of lysophospholipid (LPL). We measured free fatty acids after incubation of PhlA with various PLs [phosphatidylcholine (PC), cardiolipin (CL), L-3-phosphatidylinositol (PI), L-α-phosphatidylethanolamine (PE), and sphingomyelin (SPM)]. These experiments showed that PhlA cleaved ester bonds within PC, CL, PI, and PE and released fatty acids in a concentration-dependent manner, but did not hydrolyze SPM in our experimental conditions (Fig. 2C). Previous reports have shown that some bacterial PLA2 enzymes have hemolytic activity [5, 6, 31]. However, there is little information on hemolysis caused by bacterial PLA1 enzymes. To confirm that S. marcescens PhlA had PLA1 activity, we tried to identify the site that is hydrolyzed by PhlA using fluorescent PLs as substrates [31, 32]. As shown in Figure 3A, S. marcescens PhlA and bovine pancreatic PLA2 released fluorescent fatty acids from bis-BODIPY FLC11-PC, indicating that PhlA had phospholipase A activity (Fig. 3A). PhlA released fluorescent fatty acids from PED-A1 in a concentration-dependent manner whereas control PLA2 did not produce fluorescence (Fig. 3B), indicating that PhlA was able to cleave ester bonds at PL sn-1 sites. Using PED-6 as substrate, although fluorescence intensity increased after PhlA treatment, the maximum fluorescence was 6-fold lower than after PLA2 treatment (Fig. 3C). These results are in agreement with the proposal that His-PhlA has PLA1, but not PLA2, activity. PLA1 and PLA2 activities of PhlA. PhlA activity was evaluated in a fluorescence enhancement assay using the following PLA fluorescence substrates: (A) bis-BODIPYFLC11-PC, (B) PED-A1, and (C) PED6. Fluorescence intensity was measured at 485 nm excitation and 530 nm emission using a fluorescence microplate reader (Appliskan; Thermo Electron Corporation). Open circles show His-PhlA; filled circles show PLA2 from bovine pancreas as a control. Values are averages ± SE from three independent experiments. The studies described above showed that PhlA had hemolytic and phospholipase A1 activities. To investigate PhlA activity on a range of target cells, we studied the activity of purified PhlA in a solution reaction system with different types of cells. Interestingly, in contrast to the results on blood agar plates, PhlA hemolytic activity on human RBC was not detected in solution reactions, even at a PhlA concentration as high as 18 mM (Fig. 4A). This result indicated that PhlA did not act directly as a hemolysin on RBC. It has been reported that several animal venoms containing PLA exhibit an indirect hemolytic activity in the presence of lecithin [23, 24]. When egg yolk lecithin or PC was added to the PhlA solution reaction system, PhlA was observed to have indirect hemolytic activity on human RBC (Fig. 4A). Phospholipid requirements of PhlA hemolytic and cytotoxic activities. (A) Human RBC were mixed with various concentrations of His-PhlA in the absence (open circles) or presence of lecithin (filled circles) or phosphatidylcholine (filled squares) and incubated at 37°C for 1 h. (B) Human RBC were mixed with various concentrations of lysophosphatidylcholine (LPC) and incubated at 37°C for 1 h. (C) Products of the reaction of PC with (+) or without (-) His-PhlA were analyzed by thin-layer chromatography. (D) Human (circles), sheep (triangles), and horse (squares) RBC were mixed with 8.3 μM PhlA (filled symbols) or no PhlA (open symbols) and incubated at 37°C for 1 h in the presence of various concentrations of lecithin with 2 mM CaCl2. (E) HeLa and 5637 cells were exposed to various concentrations of His-PhlA for 1 h in the presence of lecithin. His-PhlA cytotoxicity was evaluated with a CytoTox 96 Non-Radioactive Cytotoxicity Assay kit (Promega). Open and filled circles show HeLa and 5637 cells, respectively. Values are averages ± SE from three independent experiments. (A), (B), and (D) Results are expressed as percent lysis compared with lysis of RBC in distilled water, as in the contact hemolysis assay (Fig. 1). Lysophospholipid (LPL) is one of the products from PLs hydrolyzed by PLA1. Therefore, we investigated whether LPL could cause hemolysis of human RBC. Lysophosphatidylcholine (LPC) was found to have hemolytic activity on human RBC in the solution reaction system (Fig. 4B). Using thin-layer chromatography, LPC was found to be produced by incubation of PC with PhlA (Fig. 4C). To determine the range of cells affected by PhlA, we examined various kinds of RBCs. As described above, PhlA lysed human RBC, but not horse or sheep RBC, on blood agar plates. However, all three types of RBC were lysed by PhlA in a lecithin-dependent manner in the solution reaction system (Fig. 4D). An explanation of these results may be that, in human blood agar plates, enough PL might be released from collapsed RBC during agar plate preparation to allow PhlA to produce LPL. When PL was added to sheep and horse blood agar plates, we clearly detected PhlA-dependent hemolytic activity on horse and sheep blood agar plates (data not shown). Since PC required 6-fold more PhlA than lecithin for induction of 50% hemolysis (Fig. 4A), the egg yolk lecithin used in this study might have contained enough LPL for hemolysis. However, no hemolysis was induced by lecithin without PhlA treatment (Fig. 4D). Taken together, these results indicated that PhlA phospholipase activity hydrolyzed PL and produced LPL. Since LPL is known to be a surfactant , it may have been the final effector leading to destabilization of the RBC membrane and hemolysis. We examined the cytotoxicity of PhlA using HeLa and 5637 cells. PhlA had cytotoxic activity against both HeLa and 5637 cells in the presence of lecithin (Fig. 4E). To investigate the cytolytic activity of late log phase S. marcescens culture supernatants, S. marcescens was grown at 37°C for 6 h in LB containing PL. Up to 48-fold dilutions of the S. marcescens culture supernatant induced cell death of both HeLa and 5637 cells, while supernatant of S. marcescens ΔphlAB cultured under the same conditions had no effect on HeLa or 5637 cells, indicating that PhlA was an extracellular secretion product (data not shown). A wide range of pathogenic bacteria produce phospholipases, and the putative role of PLA in virulence has been studied in some of these pathogens. Outer membrane-associated PLAs (OMPLAs) were first identified in E. coli  and orthologs were subsequently reported in numerous gram-negative bacteria, including H. pylori (PldA) . The OMPLAs have been well-characterized and are thought to enhance bacterial growth, colonization, and survival. In addition to modulation of the bacterial membrane, some OMPLAs were shown to have contact-dependent hemolytic/cytolytic activities . Another group of PLAs (e.g., YplA , ExoU , PlaA , and SlaA ) is secreted from bacterial cells. Purified ExoU and SlaA [38, 39] recombinant proteins do not show cytotoxic activity when added exogenously, and there is little information on the cytotoxicity of other secretory PLAs. To our knowledge, ShlA is the only previously reported hemolysin from S. marcescens. Although, a ΔshlAB mutant showed hemolytic activity on blood agar plates, it did not exhibit contact-dependent hemolytic activity (Fig. 1C). Therefore, we performed functional cloning, which identified PhlA as an S. marcescens candidate hemolytic factor (Fig. 2A). In the experiments reported here, we described the hemolytic and cytotoxic activities of S. marcescens PhlA. PhlA itself did not directly induce the destabilization of target cell membranes, but the LPL produced from PL by PhlA phospholipase activity showed hemolytic and cytolytic activities. Therefore, PhlA and ShlA have different hemolytic mechanisms. In addition, ShlA was expressed at lower temperature, but its expression decreased at 37°C . In contrast, PhlA was expressed at 37°C, although its temperature regulation has not been elaborated. Also, PhlA hydrolyzed phosphoethanolamine (Fig. 3C), which is required for ShlA activity , implying that PhlA production could potentially regulate ShlA activity. Tsubokura et al. reported PL-dependent hemolytic activity in a Y. enterocolitica culture filtrate. Schmiel et al. independently identified this hemolysin as a lecithin-dependent phospholipase A (YplA). However, there were no data on whether YplA also had cytotoxic activity in the presence of PL, similar to that reported here for S. marcescens PhlA. PhlA cleaved the ester bond of PL at the sn-1 site, and produced fatty acids and LPL from several PLs; e.g., PC, PS, PE, and CL (Fig. 2C). LPL production by PL cleavage might explain why PL addition was required for PhlA hemolytic activity of (Fig. 4A), since LPL may act as a surfactant and induce hemolysis. We detected PhlA hemolytic activity on human blood agar, but not on sheep or horse blood agar (Fig. 1A). However, sheep and horse RBC were lysed with purified PhlA in the presence of PL. This difference may be explained if PLs are released from human RBCs during the preparation of blood agar, and then become substrates for added or secreted PhlA resulting in the production of LPL. In agreement with this possibility, we observed hemolysis around bacterial colonies by addition of egg yolk lecithin to sheep and horse blood agar plates (date not shown). Our results on the mechanism of PhlA cytotoxic activity allowed us to quantitate cytotoxic activity in a liquid assay. Numerous reports have shown that bacterial phospholipases contribute to pathogenesis by directly hydrolyzing host membrane phospholipids and modulation of the host immune system via the production of lipid second messengers (5, 6, 31). 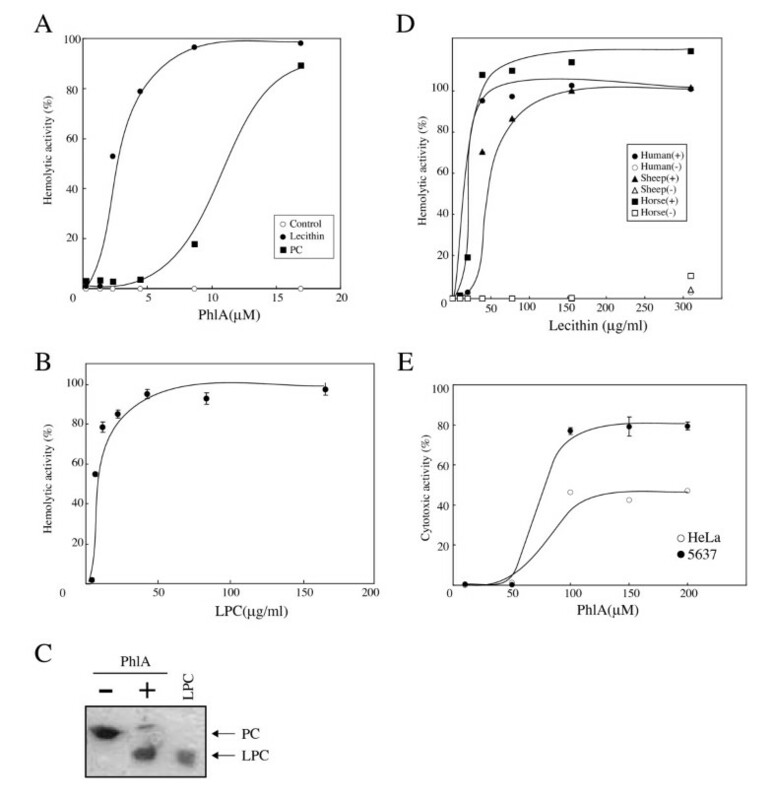 Although PhlA did not produce direct cytotoxicity on cultured cells, the pathogenetic role of indirect cytotoxicity via LPL production should be investigated. It has been reported that Pseudomonas aeruginosa ExoU inhibited neutrophil function in the lungs of infected mice  and group A Streptococcus (GAS) SlaA contributed to colonization of the upper respiratory tract . Furthermore, a PhlA-like phospholipase, Y. enterocolitica YplA, has been shown to play a role in bacterial colonization of the intestinal tract and increasing the pathological changes resulting from the host inflammatory response in the mouse model . The high degree of homology between YplA and PhlA suggests that PhlA may also play a role in S. marcescens colonization, since S. marcescens is thought to be a commensal in the intestinal tract where PLs are supplied by the host diet. The pathogenic role of PhlA remains to be elaborated. In this report, we have identified a hemolytic and cytotoxic factor in S. marcescens other than the previously reported ShlA. This new factor, PhlA, had phospholipase A1 activity. It is interesting to note that the hemolytic and cytotoxic activity of PhlA depend on the presence of phospholipids in addition to those in target cell membranes and seems to be mediated by the LPL product of the PhlA enzyme. Our results contribute to understanding the pathogenic role of microbial PLA. This work was supported a grant- in-aid from the Ministry of Health, Labor and Welfare of Japan (H21 Shinkou-Ippan). We thank Drs. J Mitobe, T Kawarai, and M Kuroda for technical advice and discussions. KS carried out most of experimental works, and drafted the manuscript. SI performed the genetic studies. NK improved some of the experimental procedures. YG provided the draft genome sequence information. MO conceived the study and co-wrote the manuscript with HW. All authors have read and approved the final manuscript.